It would be incorrect to state that “most” Christians do not view Mormonism as a Christian religion. A 2007 survey by the Pew Research Center reported that a majority of Catholics (52%) say that Mormons are Christian; 29% say they are not. 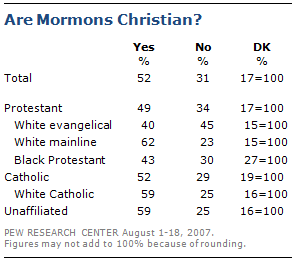 Among all Protestants, more say Mormonism is a Christian religion than say it is not by a 49%-to-34% margin. This includes 62% of white mainline Protestants who say Mormons are Christians. Of the major Christian groups, white evangelical Protestants are the most likely to say Mormonism is not a Christian religion: 45% say Mormons are not Christians, while 40% say they are Christians. While many Christians see Mormonism as a Christian religion, most Christians do not see their faith having much in common with Mormonism. Among all non-Mormon Americans who express a religious preference (most of whom are Christians themselves), fully 62% say that Mormonism and their own religion are “very different.” This opinion is held by 67% of white evangelical Protestants, 61% of white non-Hispanic Catholics and 56% of white mainline Protestants.